It feels like it’s been awhile since I’ve been on here. Every time I’ve tried to write a poem in the last several days I end up cranking out about 2 lines and then “finishing” the poem with several words of profanity before closing my notebook and filling up a glass of wine. There isn’t more to the story. Writing is rarely glamorous. Totally. The act of writing CAN be therapeutic and even fun, but glamorous, no. At least personally I’m usually inspired by struggle, so if I’m writing because I’m hurting, there’s no glamour written anywhere on my face. 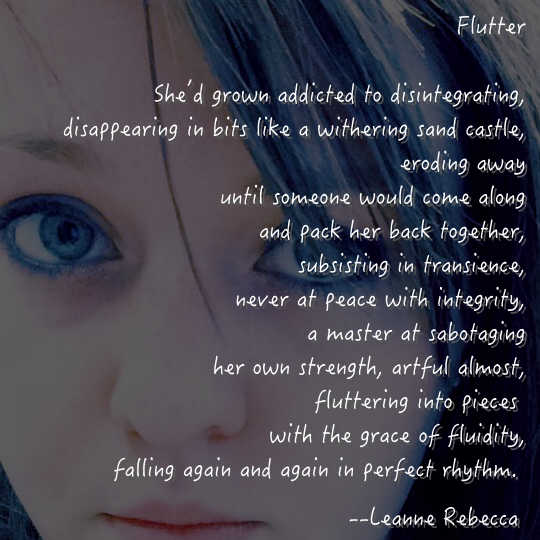 “she’d grown addicted to disintegrating” – geez thats deep. I have days when I bounce through about four different writings because I will have days where it is difficult to focus on the one. Usually my bouncing relates to a greater physical pain day but sometimes it is just because I haven’t figured out how I want to precede. What path or road I want the piece to take is mostly specific to poetry. When I bog on Coaching/Think pieces pertains to how I want to convey the message. I go piece to piece doing a bit in each and when I hit the hmmmmm for to long a period I go on to the next open piece. Essentially what I’m saying is no one said you had to only write one thing at a time and finish before the bed time milk and cookies. It’ll be there, walking away from it and letting it percolate can be beneficial. I was about 10 days doing this one off and on and percolating it made it to my mind better. A very beautifully written piece about a sorrowful but common story.